JNN 03 Jan 2014 BEIRUT — An explosion tore through a crowded commercial street Thursday in a south Beirut neighborhood that is bastion of support for the Shiite group Hezbollah, killing at least five people, setting cars ablaze and sending a column of black smoke above the Beirut skyline. The explosion took place in a crowded street in the Hezbollah stronghold of Beirut near a building that belongs to the militant group’s al-Manar television channel. The channel reported that the explosives loaded in the 4×4 vehicle were “not very heavy,” but the casualties are likely to be high because the blast struck a densely populated area known as Haret Hreik. Security sources said that the explosives weighed 30 kilograms. 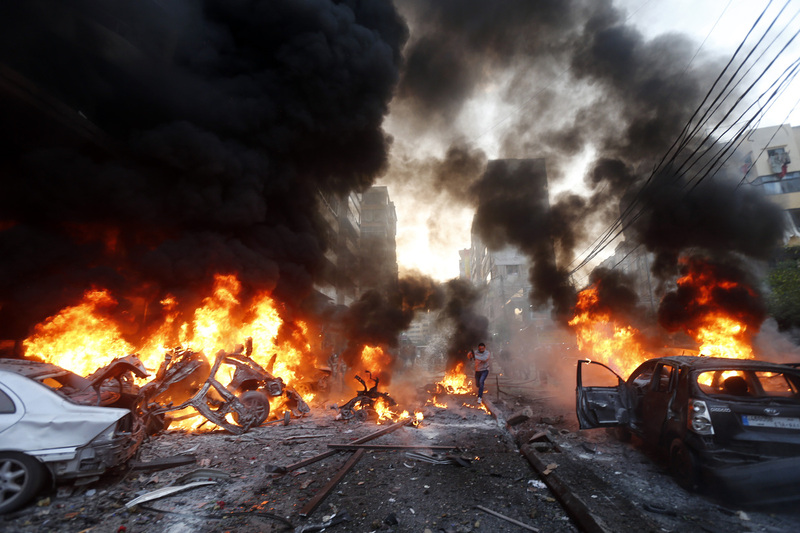 Hezbollah said the blast did not target any of its leaders, Lebanese media reported. If confirmed as a bombing, it would be the latest in a wave of attacks to hit Lebanon in recent months as the civil war in Syria increasingly spills over into its smaller neighbor. The violence has targeted both Sunni and Shiite neighborhoods, further stoking sectarian tensions that are already running high as each community in Lebanon lines up with its brethren in Syria on opposing sides of the war. Lebanon’s official National News Agency said at least five people were killed and more than 50 wounded in the explosion, which left the mangled wreckage of cars in the street and blew out the windows of store fronts. The director of the Bahman Hospital, were dozens of the wounded were taken, said many of the injured were in critical condition. Hezbollah’s Al-Manar TV said the explosion occurred “a few hundred meters (yards) from the politburo of Hezbollah.” It said the political office was not the target of the blast. Hezbollah’s once seemingly impenetrable bastion of support — Beirut’s southern suburbs — also has been hit several times in recent months. In November, suicide bombers targeted the Iranian Embassy in Beirut, killing at least 23 people. Iran is the chief patron of Hezbollah and an ally of Syria, and the Islamic Republic’s embassy is located in a Hezbollah district. Another blast in August killed around 20 people in the Beir al-Abed district, near the Haret Hreik neighborhood were Thursday’s bombing took place. “The fire burning in more than one region of Lebanon portends what is worse if we do not meet and deal with our problems away from the language of defiance and exclusion,” he said in a statement. This entry was posted in Middle East and tagged Hezbollah. Bookmark the permalink.